The final school visit for 2018 wrapped up earlier today here at Simtars. 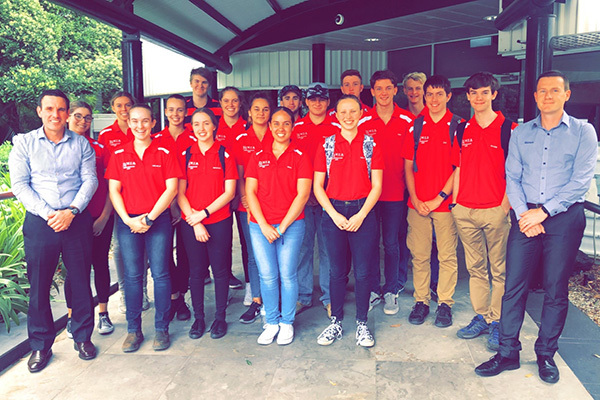 Members of the 2018 Student Ambassador Program from the QMEA (Queensland Minerals & Energy Academy) spent the morning meeting members of the Simtars Executive Team and technical staff. Following visits to (and demonstrations of) the Virtual Reality Immersive Training Theatre, the ever-popular Propagation Tube, Gas Laboratory and Dust Laboratory, the students now have a better understanding of what Simtars does to ensure maximum health and safety outcomes in the mining and allied industries. Many of the students will themselves enter a career in the mining sector and other allied industries. Being able to see first-hand the valuable work we do to ensure mine safety and health is maintained throughout Queensland, and knowing they will work in a safe environment, was a great way of reinforcing their decision to follow their chosen career path. Congratulations to the graduating student ambassadors from all the staff here at Simtars and we look forward to welcoming the newly appointed ambassadors in 2019.